Android's Do Not Disturb feature has a long and complicated relationship with alarms. In Lollipop the tiers of "priority" and "none" did a poor job of explaining how alarms fit in. With Marshmallow, there's that ongoing bug that kills the "until next alarm" option every month. 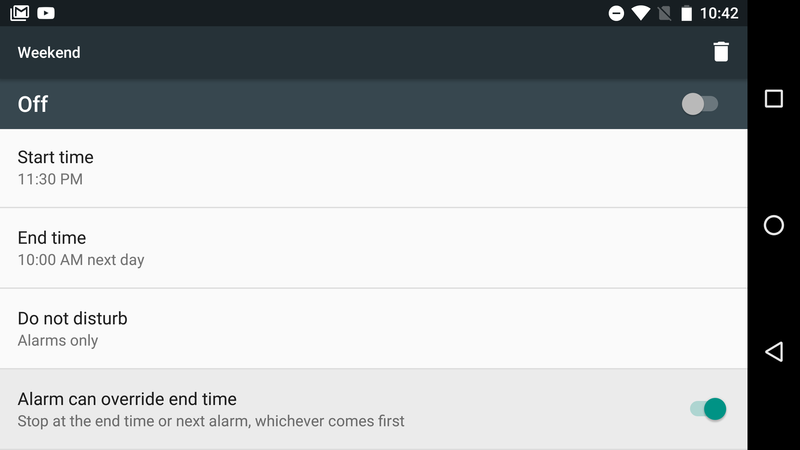 In Android N, there's a new option that might finally make alarms and DND work the way you expect. Alarms can simply override Do Not Disturb. You will find this new option when you dig down into the DND settings to create your own automatic rules or tweak the existing ones. Down at the bottom is the option to have alarms end your DND mode. Turning that on means DND will end whenever you've set it to end or whenever the next alarm happens, whichever comes first. It's like the "until next alarm" feature, but it happens all the time. This is the only change we've seen with the automatic rules so far. It might be handy if you're constantly setting different alarm times and want to make sure your phone leaves silent mode automatically whenever that happens.